Outer spacehas become Earth?s largest junkyard. It is an internationaldumping ground for derelict spacecraft, wreckage from colliding satellites,remains from mischievous anti-satellite testing, spent rocket stages, discardedlens caps and clamp bands, paint chips and, yes, at one point, even alost-to-space tool bag. All that riff-raff might be out ofsight, but it is far from being out of mind. This week, experts from around the world areattending a wake-up call type of meeting. NASA andthe Defense Advanced Research Projects Agency (DARPA) have teamed up to take ahard look at the issues and challenges of de-cluttering space of human-madeorbital debris. The result: A first-of-its-kind International Conference onOrbital Debris Removal is being held today through Dec. 10 in Chantilly, Va.
Understandingthe spacedebris problem is one thing. Hammering out viable operational concepts toeliminate the rubbish is another. Then toss in legal and economic issues, aswell as incentives. And for good measure add to the brew international policyand cooperation requirements. For manyyears NASA has considered means to ?remediate? the near-Earth spaceenvironment, that is, removing human-made flotsam from Earth orbit ? at bothlow and high altitudes, said Nicholas Johnson, chief scientist of NASA?s OrbitalDebris Program Office at Johnson Space Center in Houston, Texas. ?We havealso evaluated the feasibility of numerous concepts proposed by other U.S.government organizations, the aerospace industry, academia, and the generalpublic,? Johnson told SPACE.com. ?To date, none of the techniques examined haveproven entirely practical due to technical and/or economic reasons.? Johnsonsaid that, earlier this year NASA and DARPA ? which is renowned for itsinnovative solutions to exceptionally difficult problems ? agreed to host thisweek's international conference devoted solely to the subject oforbital debris removal. More than 50 presentations from the United States, Russia, France, Germany, and Japan willbe offered to address not only the technical and economic challenges, but alsothe legal and policy issues associated with orbital debris removal. To promotethe reliable operation of space systems in the near term, the removal of smallorbital debris is of principal interest. ?Topreserve the near-Earth space environment for the farther term, the removal oflarge debris?derelict spacecraft and launch vehicle stages, is required,?Johnson observed. ?Consequently, a variety of orbital debris removaltechniques will likely be necessary to handle the entire spectrum of orbitaldebris sizes at all altitudes.? Indeed,over the years various schemes have been aired to deal with the untidinessof orbital debris, be it huge aerogel-laden puff balls to snare debris,various types of galloping gotcha tethers, even vacuum cleaner-typecontraptions. ?This is a tragedy of the commonskind of thing,? said Jerome Pearson, President of Star Technology and Research,Inc. in Mount Pleasant, S.C. ?No one country is responsible for cleaning upspace.? Pearson is a strong advocate for aroving space vehicle based on his work to fashion a propellant-lesselectrodynamic thruster system. This ElectroDynamic Debris Eliminator (EDDE)vehicle, he said, is the only viable method known for the plucking from spaceof large debris. EDDE would be maneuverable, flyingfrom place to place in low Earth orbit. This concept is reusable with each vehiclecapable of removing many targets by simple debris capture, utilizinglightweight nets or a grappler. Pearson, however, flags a knottyissue. ?You can?t just go up there and movesomebody?s stuff without permission,? Pearson said. ?Anything that can go upand grab a piece of debris and bring it down?well, it can also grab somebody?soperational satellite and bring it down. That?s a space weapon,? he cautioned. What?s needed is some kind ofinternational agreement, Pearson said. ?There?s a lot to be done there. I thinkit may be more political?more diplomatic than technical,? he added. Oneproposal to be aired at the conference is a revisit of Project Orion ? an ideathat received a NASA technical look in the 1990s. The schemeuses rapid-fire laser pulses to blow off a micro-thin surface layer of targeteddebris. That tiny bit of blow-off acts as a miniature rocket motor. It?s enoughoomph to tease the object?s perigee ? low point of its orbit ? to where theEarth?s atmospheric drag takes hold of the object, reentering the refuse to afiery finale.? The conceptof orbital debris removal via laser ? whether by ground-based equipment, anairborne facility, or a space-based system ? has greatly advanced over theyears, said Jonathan Campbell, a physicist at NASA?s Marshall Space FlightCenter in Huntsville, Ala.
Campbellsaid that one of the principle findings from the earlier Project Orionappraisal that he managed was that ground-based laser removal was feasible andaffordable in the context of spaceflight budgets. At a cost of only a couple ofthousand dollars per object removed, this remains true, he added.? Thanks tothe continued progress in laser and associated sensor technologies, Campbell?sview is that the ground-based laser approach should be even more effective andaffordable than in the 1990?s. Campbellsaid that, while all technologies have their niche as partial solutions to theorbital debris problem, there?s a sizeable load of lethal objects in low Earthorbit. That being the case, he said, only laser technologies offer any hope ofremoving hundreds of thousands of objects economically in a reasonabletimeframe. ?There aresome 300,000 objects larger than one centimeter?and they are all moving athyper-velocity. The only way to address this huge population is with lasertechnology,? Campbell noted. ?Orbital debris removal is a complex problem, onethat will require an umbrella of technologies to do a complete solution,? hestated. At thisweek?s meeting, space law specialist, James Dunstan, along with Bob Werb of theSpace Frontier Foundation are set to call for an Orbital Debris Removal andRecycling Fund. It?s thebelief of Werb and Dunstan that the current legal regime creates perverseeconomic incentives that are greatly aggravating the problem of orbital debris.The quickest and surest path to resolving the problem, they contend, is toestablish a legal and economic environment that places a high price on anyonegenerating new debris while simultaneously creating adequate rewards for anyonewho mitigates debris. 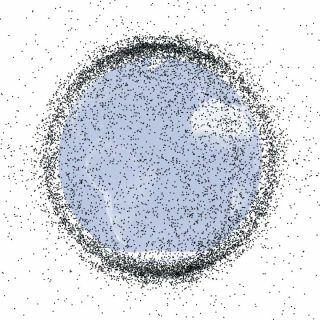 ?From thepredictions I?ve seen of how the space debris population will grow in thecoming years, it looks like the space community will need to take activemeasures soon to clean up at least some of the existing debris, or the problemcould get away from us,? said Robert Hoyt, leader of Tethers Unlimited, Inc. ofBothell, Wash.
Hoyt isbringing to the DARPA/NASA event his notion tagged ?RUSTLER?, short for RoundUp Space Trash Low Earth orbit Remediation. It too makes use of a propellant-lesselectrodynamic tether, he said, along with two other unconventionaltechnologies to enable safe and cost-effective removal of defunct satellites,spent upper stages, and other debris from orbit. ?Thequestion has always been who is going to pay to clean up the mess? Nobodyreally wants to get stuck with that bill,? Hoyt said. How you distribute thecost fairly among the many nations and commercial entities that utilize spaceis a tough conundrum to address, he admitted. ?It?s thecommunities that agree to share the cost of keeping their cities andenvironment clean that are able to prosper,? Hoyt suggested. ?The internationalspace community is going to have to come to that same sort of agreement if itis going to prosper in the long term.? An upshotof this week?s confab of gab by experts is bound to be what next? For one,there?s likely to be a multiple-choice of technologies that appear worthfurther study. Actual in-space testing of debris removal ideas also seems to bein the cards. Also, what space debris targets are good candidates? ?Theconference is what I consider a paradigm shift. We?re moving from defining theproblem to looking for real solutions,? said Campbell. Given thisparadigm shift, Campbell said he was hopeful of seeing increased funding inthis area as time goes along. ?There?s a need to turn this trend around in thegrowth of space debris. It?s going to take some time to do it. But we seem tobe heading in the right direction now,? he concluded.